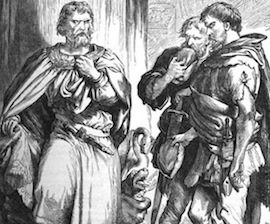 The scene in which Banquo is murdered opens with a little surprise. There's a Third Murderer, and apparently he has just now shown up. First Murderer is asking him, "But who did bid thee join with us?" Third Murderer answers shortly, "Macbeth" (3.3.1). Second Murderer grumbles that there's no reason for Macbeth to distrust them, since he told them exactly what to do. After this, it's all business. The three murderers attack Banquo and kill him, but botch the job, because Fleance escapes.